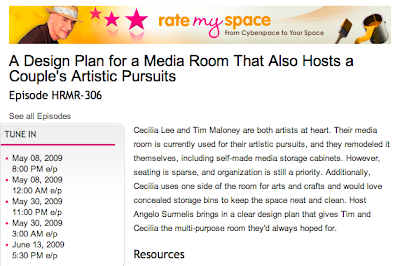 One of my posts a couple of months ago was about being filmed for HGTV's Rate My Space. The show is coming up soon. It is May 8, 2009, at least that's what is posted today. A couple of weeks ago it was going to air on May 6 so I am not sure if there will be a change or not closer to the time it airs. In any case you can check for yourself looking for HRMR - 306 in their Episode Guide. Since I am not a main player in this show and I have no idea what they will include from all the filming Dan did I might only be on for 3 seconds so you'll have to watch closely or you'll probably miss me. The show will feature part of my studio as an inspiration space for some other folks. Here's hoping that they found some good clips to use. can you watch this online? I wish I got this channel!